The Warrior Spirit, Leadership, Direction. 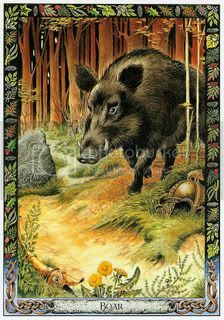 The card shows a boar in the forest. In the foreground lies a bronze carynx, with its mouth in the form of a boar's head. Such a battle-trumpet has been found in Grampian, Scotland. By the path, and also from Scotland, is the Boar Stone, beside which as all Pictish kings took their oaths. To one side we also see the discarded bronze helmet of a warrior, complete with boar crest - as found in Powys Wales. In the foreground grow mugwort, dandelion, and wild asparagus. Torc can open you to the warrior spirit, and help you to find your direction in life.He calls you into the forest to discover a secret about yourself and about the world. The ritual boar-paths exist in the Inner world too, and if you follow them you will come face to face with an animal embodying the wild and untamed power that lives within each of us. Stare closely at him and you will discover he is a representative of the Goddess - his skin can heal you, he can inspire you to write music and poetry, his primal power can make you leader or chief. See if you can use your wildness and your energy for genuine acts of heroism in a world hat longs for insight and healing. The Divine Hunt was seen as more than sport. It was a sacred act in which the hunter and the hunted entered into a special relationship The Hunt became the symbol for the journey of the Spirit - in which both life and death play their part, and in which healing is found through the process of hunting. The Celts linked these two concepts. We are called to renew ourselves. In the forest in the ritual boar-path. First we must ask for the blessing of the gods/dess. Then if we dare to follow the path into the darkness, we will come face to face with the terrifying figure of the Wild Boar. If we face him with courage he will allow us to absorb some of his power. do you think that could be why the neck ornament indicating power and wuthority is/was called a torc? Interesting idea! maybe! does anyone know? I thought I saw something last week on the Irish language site... but couldn't find it again... and I am sure it related torc/boar and leadership together. I know that in some Celtic tribes the boar was described as the most powerfull animal, a very strong totem. Since boars are very protective about their family, might indicate this leadership abilities.. as he guides his family to safe territory.I am unsure where it was however, in a book or on a site. Perhaps someone else can help me on this. Arthur, even though his name comes from Art or Artos, the Bear, was known as the Boar of Cornwall! I seem to have come in on this discussion a couple of years late but I've just looked Torc up in the Oxford English Dictionary online... it says the derivation of Torc as a neck ornament is from the Latin torques/torquis meaning 'a twisted neck-chain or collar' . Thanks for that.... i still wonder though. Me too. It's possible I suppose that the Romans took the root of their 'Latin' word from the Celts in the first place. Or it could be a Latin word coined by antiquarians in the seventeenth century. If I remember correctly (don't have the OED in front of me now) the etymological notes on the OED seemed to suggest the word's first recorded use was around that time. I can check again when I'm back at work. You really need a more learned linguist than I am! well at least you are a linguist ! lol I still have problems with English !!! Something to think about... The boar was a chthonic symbol to the pre-christian Celts. See "The Role of the Boar in Celtic Iconography and Myth"
In Irish history its a thick solid gold necklace which was worn by the High Kings and Clan leader and/or his immediate family. A sign of high status/warrior/knowledge. The Irish History museum in Dublin has a large selection from Iron/Copper age until more recent times - I think they were also worn by Iceni in Uk, as there are mentions of Boadicea wearing one in battle to show her status. Nowadays you see them in a lot in traditional Greek jewelry shops with sheep/goat/snake heads on the ends - very pretty but the original purpose is long lost in history. "Let us consider the Hunt somewhat in more detail, with special reference to the names mentioned; and let us begin with that of Twrch Trwyth: the word Twrch means the male of a beast of the swine kind,, and twrch coed, 'a wood pig,' is a wild boar, while twrch daear, 'and earth pig,' is the word in North Wales for a mole...the word orc occures in the genitive as uirc, and it means a 'pig' or 'boar;' in fact it is, with the usual Celtic loss of the consonant p, the exact Goidelic equivalent of the Latin porcus, genitive porci. " He continues: "But we have here a discrepancy, which the reader will have noticed, for twrch is not the same word as Irish orc, the nearest form to be expected in Welsh being Wrch, not Twrch; but such a word as Wrch does not, so far as I know, exist. Now did the Welsh render orc by a different word unrelated to the Goidelic one which they heard? I think not; for it is remarkable that Irish has besides orc a word torc (emphasis mine), meaning 'a boar,'and torc is exactly the Welsh twrch." So here Mr. Rhys suggests that the etymology of Torc fits nicely with its Welsh equivalent. Here we also have the Latin transliteration of "torc," or its Goidelic equivalents, to the Latin porcus (hence, pork). To be honest, when I read "orc" in this snippet the first thing that came to my mind were J.R.R. Tolkien's "Orcs." For a moment I lapsed into a fantastical mind-set...but I digress.